The engagement platform with anonymous, crowdsourced employee listening aims to help employers to listen to their employees at scale on a real-time basis. Read on to know more about Hyphen's journey, which was a participant at last year's TechHR Startup program. It is a fact that most of the startup ideas spring out of a brainstorming session over a beer. 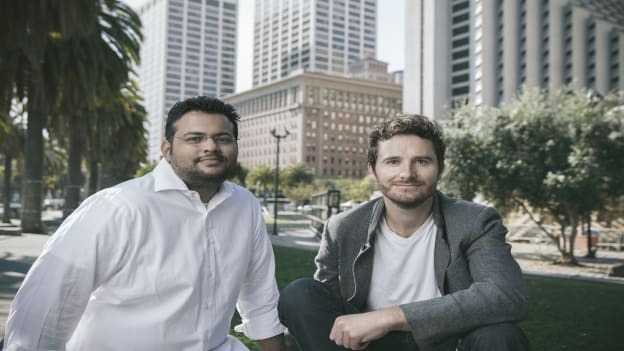 So is the case with employee engagement platform Hyphen, co-founded by Ranjit Jose and Arnaud Grunwald. Both Ranjit and Arnaud, in their previous jobs, saw frustration building up in large teams as the growing size of the company made it difficult for employees to reach to the management. Or in other words, difficult for the employees to voice out controversial opinions or feedback without feeling threatened. So the duo approached the HR department with a proposal to conduct a survey to find out what their teams were thinking about and how could changes be made to address issues. But they were held back by the classic response of an approaching annual survey in the six months and hence the suggestion to find out at that point in time. It is then the duo concurred that the best way to get this information was to enable the employees to speak up themselves rather than falling back on the classic structure of asking them. Thus was born Hyphen in 2015-an engagement platform with anonymous, crowdsourced employee listening with real-time insights and people analytics for the HR and management. The idea was simple-allow organizations to hear their employees. As organizations get larger, employees think twice before putting out a controversial suggestion. It is thus important to ensure that employees are able to do it anonymously. In bigger organizations, it becomes difficult for them to get a quick sense of what is important to people. And people are an organization’s most important assets. To retain the best people, an employer needs to foster an environment where employees feel that their opinions matter. 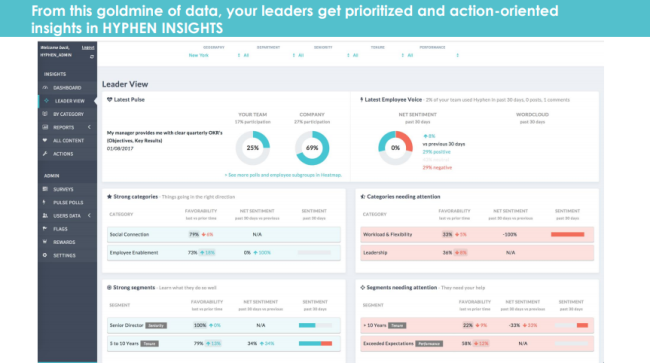 So Hyphen is helping organizations to listen to their people in real time rather than in once a year top down surveys. For instance one of their customers Titan, on a weekly basis can know what their people care about. Thus organizations can listen at scale on a real-time basis. How Hyphen enables this is through its four different offerings. The offerings include engagement surveys and quick surveys which can be done in a more nimble, mobile-based way. The Smart Insights offering is about employee life cycle and experience – for instance, their views on how convenient the onboarding experience is. Through Pulse Polls, an employer can roll out or pulse out questions once a week to get a quick sense of what employees are thinking across the company. In the fourth module Employee Voice, employees get to give their ideas, suggestions, anonymously allowing companies to crowdsource them. The startup claims that the depth of analytics it provides is a key differentiator for it. Additionally, the startup also makes it easy for managers and top management to look at the information in a more dynamically ingrained fashion than relying on static reports. It also adds that the UI is extremely seamless from the mobile perspective. As the industry matures and grows, Hyphen is betting on more and more companies getting into an active listening mode to listen to their employees. With its real-time and advanced analytics, the startup hopes to gain a bigger share of the market. In the pipeline, are plans to build on the inbuilt AI and ML capabilities and double down on the real-time sentiment analysis piece. The startup's vision is what it calls enabling "the augmented manager". It believes managers will be increasingly expected to be good leaders and Hyphen wants to help them on a real-time basis. Over the course of the last three years, the startup which follows a subscription-based monetization model has amassed customers in the US, startups in the Bay area, and many renowned names such as Hero MotoCorp, Rio Tinto, Ola, Titan, InMobi, Epsilon, Dollar Shave Club and Dr. Lal Path Labs among others. Ashish Sinha, Country Head (India) Epsilon stated, “Hyphen has changed the way we listen to our associates and the speed at which we, the management can take action. The many real-time insights that we have collected in just a few months have had a positive impact on our teams and have been at the origin of initiatives that we believe can materially improve employee engagement and retention." As per Deloitte Consulting LLP, the HR technology marketplace is a $400 billion market globally. It is estimated that Indian firms can save at least $600 million annually with HR tech. No wonder there is increasing demand for tech products in all facets of the HR function-be it recruitment, engagement, or learning and development. In light of this, many startups have sprung up in the space. For instance, HR tech startup inFeedo with its product Amber, is one such startup leveraging the power of AI in HR to improve employee experience/engagement. Similarly, there is nFactorial which addresses the engagement challenge with products like n!Gage, which is a continuous employee feedback platform that allows managers to get real-time data and insights about what their employees are feeling. There are many international players in the employee engagement space as well such as Canada based PostBeyond, which works on in-bound engagement, and Australia based employee engagement and recognition platform WooBoard. Then there is Singapore based startup EngageRocket which provides bite-sized action plans to guide managers to improve leadership style by analyzing employee feedback in real-time. In the midst of this growing competition, how far will Hyphen’s product be able to differentiate and scale will be the real determinant of its success. While engaging employees by listening to them is in vogue now, the real question is-how many companies will bank upon Hyphen hear their employees out? That will be something to watch out for.